Amys Gifts will send a gift from you directly to the lucky recipient and if you require the item gift wrapped add our Gift Wrap Service to your basket. Most items from our shop can be wrapped or gift bagged, with only a few exceptions to awkward shaped items. We'll use either pattern paper gift wrap, clear cello wrap and ribbons or a gift bag whichever is most suitable for the size and shape of the gift. 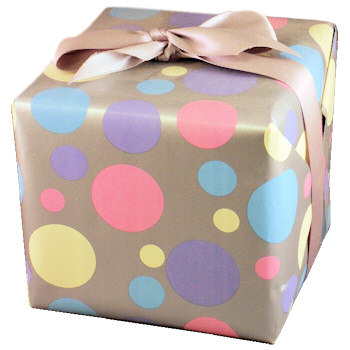 We have various assorted gift wrap designs and will use the most appropriate style to suit the occasion. Please fill in the options below the main picture to help us choose the best style to use. For example: is the gift for a man, woman, girl, boy or baby and the occasion if necessary . If you fill in the Greeting or Message box we include a small handwritten gift tag. This is for a single gift to be wrapped. If you are purchasing multiple gifts, please add the gift wrap service to your basket for each item you want wrapped. Email or contact us if you have further queries or instructions.